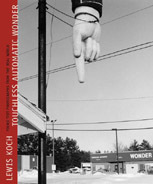 Created as a poetic and visual journey, Touchless Automatic Wonder spans twenty-five years and four continents. These striking photographs capture "found text": the sometimes mysterious, occasionally humorous, often cryptic presence of words in the everyday landscape. This intriguing approach at the intersection of language, image, and the social landscape will appeal to readers interested in contemporary art and photography, popular culture, and conceptual concerns both literary and visual.